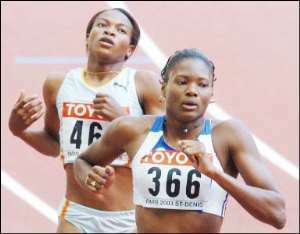 Ghanaian female sprinter Vida Anim last Saturday won the sprint double at the Dakar international athletics meeting. The event, held at the Leopold Senghor stadium, was honoured by the presence of IAAF President Lamine Diack, African Athletics Confederation President Hamad Kalkaba, among many other guests. A number of good performances were achieved including a 45.29 run by Zimbabwe's Talkmore Nyongani who improved by one hundredth of a second, the current world's fastest time of the year. It was a very close finish in both men's sprint races with 2002 World Cup 100m winner Emedolu outsprinting Ghana's Aziz Zakari twice. Amy Mbacke Thiam of Senegal, the 2001 400m World champion and a recent bronze medallist at the World Championships in Paris, was victorious in the one lap race (51.89 sec). She also ran the 200m in which she finished a decent third (23.54 sec). African record holder in the triple jump and World Championships silver medalist, Francoise Mbango of Cameroun, dominated her event with a 14.17m leap. Two national records were set in the course of the meeting. First by Ezzaraoui Latifa of Morocco, African junior champion,who managed 13.40m in the Triple Jump and then by Adama Sane of Senegal with a 45.93m throw in the Javelin. The International meeting of Dakar marked the start of the African Athletics Confederation's 2004 circuit of events.